In the shadow of the Troodos Mountains on the northwest coast of Cyprus lies Poli, a charming and authentic little resort town. While not as pretty as nearby Latchi, Poli teems with gourmet restaurants and lively tavernas and boasts some of the best beaches in Cyprus. Ideal if you want to escape the tourist-heavy towns of Paphos and Limassol, Poli has much to offer the eager holidaymaker: whether you would rather lazily sunbathe on a Blue Flag beach, watch the world go by at a cafe in the dusty square or explore the tranquil groves and waterfalls nearby. Our collection of the best places to stay in Poli have an authentic and laid-back feel. Polis has had a colourful history. Founded as Marion by the Mycenaeans in the 11th century BCE, it was destroyed during the civil wars of Alexander the Great's successors but was later rebuilt by a descendant of Ptolemy, only to be abandoned due to Arab raids along the coastline. By the medieval era, it was Poli Chrysochous and a major municipality of Cyprus. While it doesn't have the treasure trove of archaeological sites that Paphos can boast, it does have an excellent archaeological museum that gives a good scope of the town's heritage and nestling amidst the tree-bearded Troodos Mountains are a whole host of perfectly preserved Byzantine monastries, ancient mines and old villages like nearby Kakopetria, a protected village, famous for their gorgeous architecture and locally-made chairs. Life in Poli revolves around the square - the laid-back beating heart of the town - where you can find the tavernas, restaurants, cafes and shops. If you want to hire a bike and explore the countryside, take a scubadiving course and explore shipwrecks or go on a quad-bike safari, then head to the square. Consider visiting the surrounding peninsula - a nature reserve that's said to be the most beautiful place in Cyprus - or trek to the Caledonia waterfall. Part of the glory of Poli is its beautiful beach; crescent-shaped, armed with bags of golden sand and glittering turquoise waters, it is the perfect place to soak in the sunrays with a good book. Part of the Khrysokou Bay area, it is remarkably underdeveloped when compared to the rest of Cyprus, and as such, you can see turtles nesting on the beaches. Visit the Archaeological Museum for an insight into Poli's colourful past. Lounge lazily on Poli's Blue Flag beach... who knows, maybe you'll spot some turtles. Explore the belly of the sea on a scubadiving course. Trek through the Troodos Mountains and explore beautifully preserved Byzantine monastries. Follow the stream up to the Caledonia waterfall. Go off-road on a quadbike safari! Get yourself to the Baths of Aphrodite, a blue lagoon, and marvel at the mythical site. To ensure a room at one of the best places to stay in Poli we recommend you plan your trip well in advance. 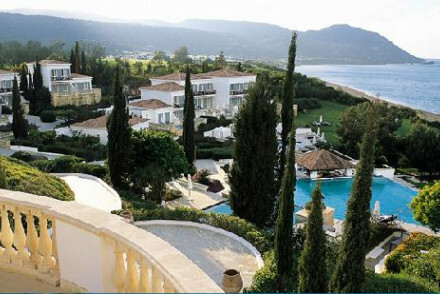 Anassa: one of the finest hotels in Cyprus, offering gorgeous seaside views on Tuscan-style grounds. There is a spoiling spa, sumptous restaurant, tennis courts and several swimming pools. Utterly divine. Fly to Paphos International Airport, 55km away, and get public transport to Poli. During the summer, the sea warms at 27 degrees and the average temperature at around 26 degrees. If you want to escape the summer crowds, go during early autumn when the weather is more clement. Browse through all our properties in nearby Paphos. One of the island’s finest hotels, with glorious Tuscan-style grounds, fabulous rooms, top spa, excellent restaurant and superb views from lovely terraces. Village harbour a short walk away, and activities include hiking and scuba diving.